Cypermethrin & miconazole nitrate shampoo to control ectoparasites & fungal infection of the skin. Shampoo Cypermethrin & miconazole nitrate shampoo to control ectoparasites & fungal infection of the skin. 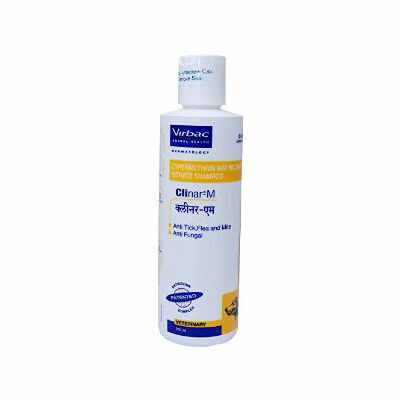 CompositionCypermethrin - 1.0% w/wMiconazole Nitrate IP - 2.0% w/w Indication Ticks, fleas & mites infestation of skin.Fungal infection of skin of dogs. Direction of UseWet the hair coat with warm water and apply a sufficient amount of shampoo to create a rich lather(Avoid contact with sensitive area like eyes & ears).Allow the shampoo to remain on hair for 5-10 minutes then rinse thoroughly with clean water and repeat may be used initially 2-3 times a week for 4 weeks.Then reducing to once a week, or as directed by veterinarian Presentation200 ml bottle.